Last week, we posted an item featuring the above photo of a Red-tailed Hawk appearing to drag-race a "jumbo jet." A hawk-eyed reader points out that the aircraft in question was actually a DeHavilland Canada DHC-8-402Q Dash 8. 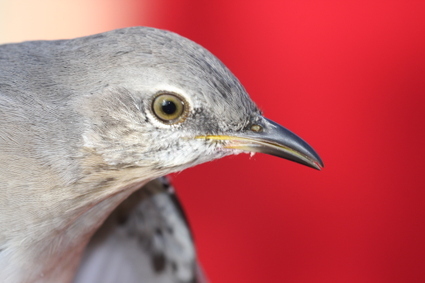 The Meadowlands Blog regrets the error, and eagerly awaits enrolling in a "Aircraft ID for Beginners" course. 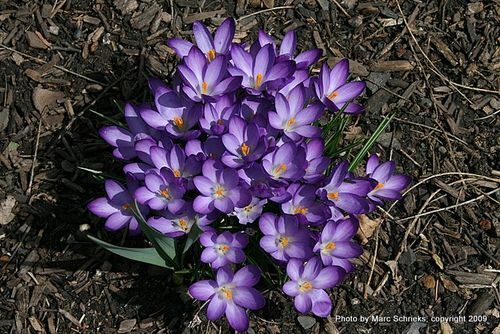 NJMC staffer Marc Schrieks took this shot of Crocuses at DeKorte Park last week. 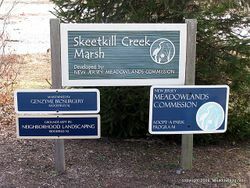 Skeetkill Marsh Clean-Up: Thank You! 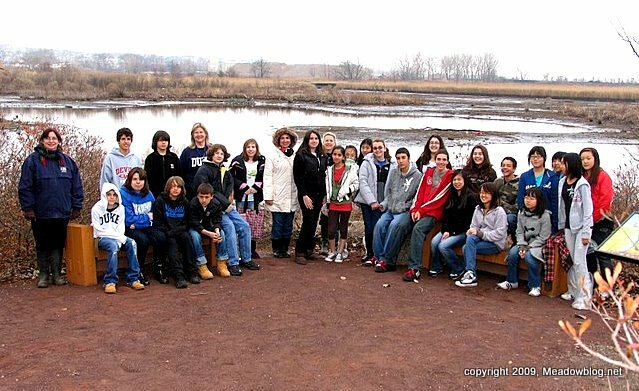 More than 50 middle school students, local businesspeople and Ridgefield residents joined forces on Thursday to clean the Skeetkill Marsh as part of the Me adowlands Conservation Trust’s (MCT) annual Clean-Up Day. The cleanup was organized as part of the MCT’s Park Stewardship Program, which recruits volunteers from corporations, schools, civic clubs and other organizations for clean up and site maintenance projects. Volunteers spent three hours removing more than 50 bags of litter from around the marsh and public sitting area, including food wrappers, soda bottles, metal rope, plaster and a truck tire. Click "Continue reading…" for more information and clean-up photos. 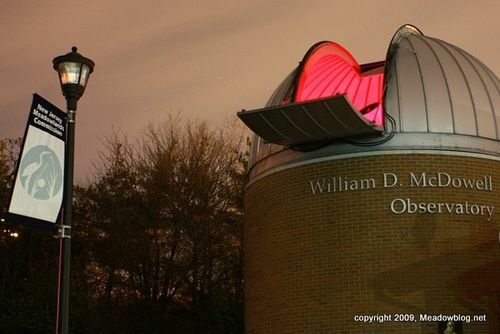 The William D. McDowell Observatory is open to the public for viewing the night sky from 8 to 10 p.m. on Mondays and Wednesdays. Click here for more information about the observatory and the upcoming viewing schedule. By the Barge Club in Carlstadt, where the Meadowlands Commission is going to build a new public boat launch, the cormorants are back in full force. More on Double-Crested Cormorants here. 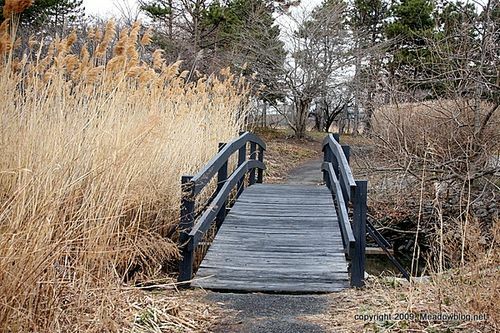 One of the nifty unsung public parks in the Meadowlands is Snipes Park in Secaucus, a riverfront park that offers great views of the Hackensack and any birds that might be on or above the river. The park is located on the Meadowlands Parkway behind WWOR. You'll see signs just to the left of WWOR's gated parking lot. On a recent trip, we got some great looks at Buffleheads floating down the Hackensack. There are barbecue grills, picnic tables, benches and an ADA-compatible playground. Now that the weather is getting warmer, this is a nice place to chill. Click "Continue reading …" for more pix of the park and its neighbors. We saw this American Kestrel arrive with dinner earlier this month, a reminder of nature's ever-present food chain in action. She hunts the fields off Valley Brook Avenue on a regular basis. 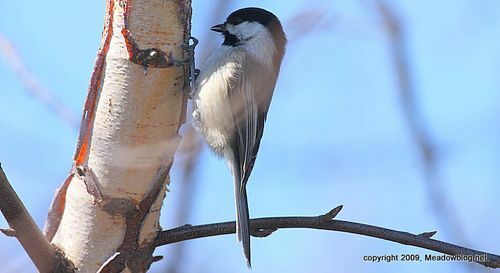 "Birding for Beginners" will be held on Sunday (March 29) from 1 to 3 p.m. at DeKorte Park in Lyndhurst.